Snoring mouthpieces have become a popular snoring cure these days, sending snorers by the dozen to their local pharmacies such as Walgreens and CVS to find relief. The primary reason why this has become a popular choice is simple -they are effective and inexpensive. After testing several dozens of them, I can attest to their effectiveness. Can snoring mouthpieces be purchased at Walgreens or CVS? You may have done your research and have decided to purchase a mouthpiece from your local drug store instead of online. 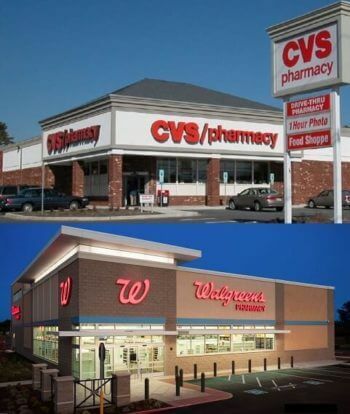 While you may find these devices at drug stores outside of the United States, you will not find one being sold at a retail store within the US. The reason being that boil and bite mouthpieces that are designed to stop snoring is considered “class II medical devices” by the Food and Drug Administration. Such medical devices are regulated by the FDA and actually require a prescription to purchase. In other words, you can’t simply grab one off the shelf and head towards the checkout counter. Selling such products from the shelf is illegal which is why you will not see a snoring mouthpiece in a retail drugstore within the US. What about sports or teeth grinding mouth guards? Sports/teeth grinding mouthguards are not the same because they do not hold the jaw forward. After finding out that snoring mouthpieces are not available at Walgreens or CVS in the sleep aid section, you may head over to the dental aisle and spot what appears to be a mouth guard very similar to the snoring mouthpieces that you have seen online. 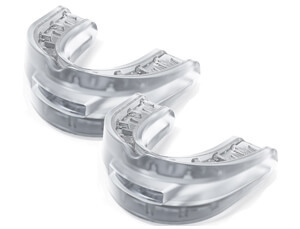 These are labeled as mouthguards for teeth grinding or contact sports. Nightguards are being sold under names such as Dentek, Doctor’s, Sleepright, Packers, GrindRelief, and Oral-B. These products typically sell for $15-$20 which is considerably less expensive in comparison to the ones that can be found online. What’s the difference? While teeth grinding mouthguards may look similar to anti-snoring mouthpieces, there’s one very important feature that differentiates the two. The teeth grinding mouthguards or sports guards are not designed to hold the jaw forward. Remember, snoring mouthpieces are mandibular advancement devices and have both an upper and lower tray that fit closely around the teeth. The lower tray protrudes slightly in front of the upper. As a result, the jaw is held forward while you sleep and the airway is tightened which prevents the vibration of tissue. Snoring typically originates in the throat area when tissues vibrate against each other. In comparison, teeth grinding mouthguards typically have only one tray which will not hold the jaw forward. 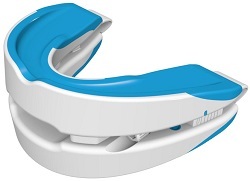 Sports mouthguards more closely resemble those used for snoring but the upper and lower trays rest directly on top of each other, which does not allow the jaw to remain forward. 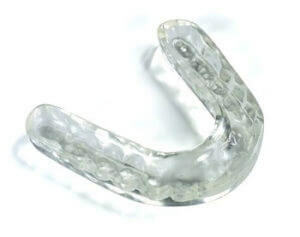 Sports mouthguards or bruxism guards that are used for snoring simply do not work because they are designed to provide a protective barrier between the teeth and not to hold the jaw forward. Why can online retailers sell them but not drug stores? This may leave you wondering why such mouthguards are sold online but not in drug stores such as Walgreens or CVS. As mentioned earlier, such products are considered a class II medical device by the FDA and require a prescription. Reputable online retailers require you to answer a questionnaire which evaluates whether or not you are a good candidate for a snoring mouthpiece. These questionnaires are reviewed and the manufacturer decides whether or not to sell to sell their product to you. There are a number of online stores that outright sell snoring mouthpieces without requiring you to complete a questionnaire. These retailers are typically less reputable and are technically selling the product illegally. Will I ever be able to buy one locally from a store? For a number of reasons, some are still not interested in purchasing a mouthguard online. Is it possible that snoring mouthpieces will be available for purchase from the store shelf sometime in the future? In all likelihood, unless the FDA changes the classification of this device, you will not see snore guards hit the store shelf, at least in the United States. In other countries such as the UK or Australia, you may find such products on the shelf due to more relaxed regulations. Snoring mouthpieces have been sold by prescription only for over three decades now so it’s unlikely that this will happen anytime soon. In other words, don’t expect to see these at your local Walgreens or CVS anytime soon. If you would like to purchase one online, you can review this comparison chart which has lots of great information and links to where each can be purchased, or you can simply choose one of my top 3 picks shown below. I’ve tested over two dozen mouthpieces and these three really stood out. Best of all, they all shipped and arrived quickly, which is the next best thing to visiting CVS or Walgreens and getting immediate relief from your snoring. Next post: Tonsillectomy and Snoring – What’s involved with this procedure?